Tabebuia Apricot is an excellent choice for inland valley locations where there is a light frost at the coldest. Tabebuia Apricot is the result of a cross between Tabebuia impetiginosa and Tabebuia chrysotricha. Tabebuia Apricot is a slow growing tree. The parent species make 25-30 feet and much more in Central and South America. Tabebuia Apricot is smaller or slower growing than its parents. The Apricot Trumpet Tree blooms late in the Winter or Early Spring. Tabebuia Apricot often blooms before the leaves come out. As a hybrid seeds will not be the same. There are several other hybrids of these two species that are occaisonally on the market. Tabebuia chrysotricha will bloom in a high shade environment. I have only seen plantings and recommendations of full sun for Tabebuia Apricot. Tabebuia Apricot will tolerate a lawn setting but once established will only need nominal amounts of supplimental water. 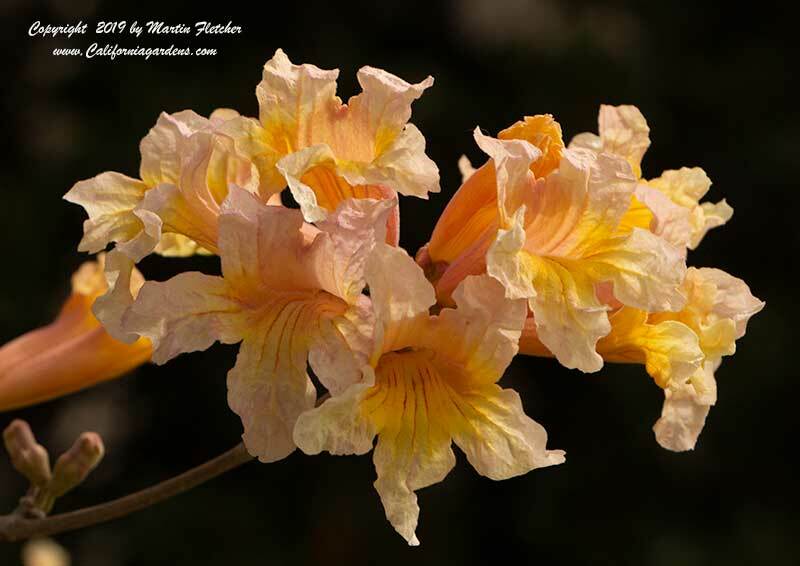 A cloud of apricot flowers - Tabebuia Apricot - Apricot Trumpet Tree. High resolution photos are part of our garden image collection.